Many people believe that the FDA is focused on protecting the American people but in real life much the opposite is true. This is a great example of how the FDA is lacking in their efforts to protect us. So remember, just because it is “FDA Approved” doesn’t mean it is good for you. However, the new report says those numbers are often meaningless and dangerous because products with high SPF ratings sell a false sense of security, encouraging people using them to stay out in the sun longer. Now we’re not saying that you should be unprotected in the sun but not to use sunscreen. Vitamin D is essential for our body but toxic chemicals are not. Getting sunburned is not good for the body but getting tan is. So we’ve provided below a homemade coconut oil sunscreen for you to use this summer. Your Sunscreen May Be Your Ticket to Skin Cancer! The white goop, creams, and ointments might prevent sunburn, but new studies now show it may accelerate cancer growth. Researchers at the Environmental Working Group found that many popular sunscreen products may actually increase the speed at which malignant cells develop and spread skin cancer because they contain chemicals and even vitamin A. Why is the truth not talked about? We might never know. 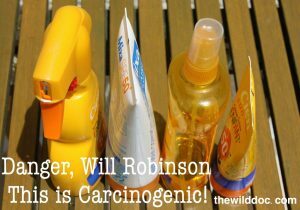 Even while the FDA keeps their mouth shut and has never said that sunscreens prevent skin cancer, yet manufacturers try and promote their products as “cancer prevention”. Sunscreen manufacturers need to sell their product and continue promoting their products as “necessary” for safe sun exposure. Sadly, they have taken something as great as the sun that God created, that without it life would not exist, and have fooled us into believing that it is deadly. Their lies couldn’t be further from the truth. It is clear that commercial sunscreen ingredients (like oxybenzone and methoxycinnamate) disrupt hormones and are carcinogenic (CANCER CAUSING). The use of the hormone-disrupting chemical oxybenzone, penetrates the skin and enters the bloodstream where it can cause more than just skin damage. An FDA study found that even vitamin A has “photocarcinogenic” properties, meaning that it results in cancerous tumors when used on skin exposed to sunlight. “Tumors and lesions developed up to 21% faster in lab animals coated in a vitamin A-laced cream,” the report said. “There was enough evidence 10 years ago for FDA to caution consumers against the use of vitamin A in sunscreens,” Jane Houlihan, EWG’s senior vice president for research has noted. What should you do? Get safe sun exposure! It is the best source of vitamin D. But avoid sunburn, which may increase your risk of skin cancer as well. Gradually build your tan and then wear protective clothing or get in the shade before you burn. If you must use a sunscreen, use zinc oxide sunscreens. These types of sunscreens remain on the surface of the skin and do not cause chemical toxicity issues like commercial sunscreens. The two biggest downfalls are still the fact that they block your body’s ability to produce Vitamin D and may cost a little more. The cost of avoiding skin cancer is well worth it though! Overall, the best protection is protective clothing after adequate sun exposure for your daily dose of Vitamin D.
Using a double boiler (or a small pan over very low heat), melt your coconut oil, almond oil, shea butter, and beeswax together. The beeswax will be the last to melt. When the beeswax is melted, remove the mixture from the heat and let cool to room temperature. If you’re using zinc oxide, whisk it in at this point, being careful not to create a lot of dust. If there are some lumps, that’s OK. They will break up when you whip the body butter in step 4. Move the mixture to the fridge for 15-30 minutes. You want it to start to set up, but still be soft enough to whip. Take the mixture out of the fridge and using a stand mixer or hand mixer, start to whip it. Drizzle in the red raspberry seed oil or the carrot seed oil, and any essential oils of your choice, and continue whipping until the mixture is light and fluffy. Use as you would any regular sunscreen. Application rates will depend on your activity and exposure to water. Store in a glass container in the fridge between uses. What’s Wrong With High SFP? Current sunscreen controversies: a critical review. Influence of the photostabilizer in the photoprotective effects of a formulation containing UV-filters and vitamin A. The hairless mouse in skin research. Application of sunscreen–theory and reality. Sunscreens – which and what for? Sunscreens, skin photobiology, and skin cancer: the need for UVA protection and evaluation of efficacy. Randomized trial of 13-cis retinoic acid compared with retinyl palmitate with or without beta-carotene in oral premalignancy. Photo-co-carcinogenesis of Topically Applied Retinyl Palmitate in SKH-1 Hairless Mice.